Here are four simple things you can do right now! Volunteering is a great way to help pets in need and meet other caring humans like you! There are a number of opportunities to lend a helping paw to shelters and rescue groups near you. 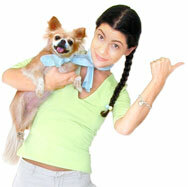 Search for recent volunteer opportunities near you posted on Adopt-a-Pet.com. Sign up as a volunteer today to find out how you can help shelters and rescue groups near you. You can save a life right now by helping shelter pets get seen on your favorite networking sites! Just use our site to search for a dog, cat, or other pet that needs a home. 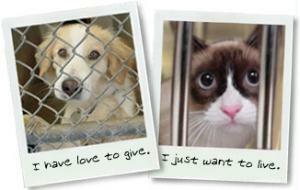 Choose a pet you want to help from the list and click to get their info. Then just click on the social media buttons to help the pet get seen and adopted! Promote Adoption! Be the reason a homeless pet gets adopted! 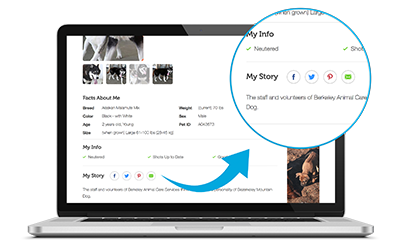 Use one of our pet-search widgets to let users of YOUR website search for pets right from the site! Highlight an adoptable pet at your local shelter by adding a "pet of the day" to your website! Will homeless dogs and cats have a chance to find a home? For a homeless dog or cat, part of the problem is being seen, so that compassionate people like you know that they need a home! Your tax-deductible contribution gives them a chance to be noticed, so please donate today!